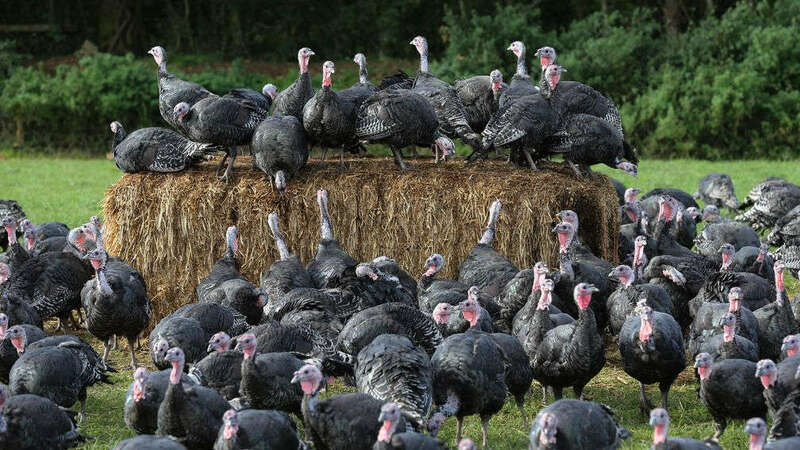 All turkeys from Rosamondford Farm are inspected to ensure you receive them in perfect condition. Please use the following guide to ensure a moist, succulent and tasty turkey on Christmas day or any other special occasion. Remove the turkey from its packing and take out the giblets. Dry and store in a cool place such as the bottom of your refrigerator. Ideally, our turkeys should be cooked within three days of purchase. Please note that all turkeys and ovens are different. Cooking times are approximate — you will need to use your own judgement and check regularly. Adding stuffing will increase cooking times accordingly. Follow these steps for the best-tasting bird. Pre-heat your oven to 230°C / 450°F / gas mark 8. Fan-assisted ovens can be reduced accordingly. Remove any string from around the turkey. We recommend you cook stuffing separately. However, should you wish to stuff your bird, fill the neck cavity only. You can also put a large apple or peeled onion into the body. Use the total weight of the stuffed turkey to calculate cooking times. Sprinkle the whole bird with salt and pepper then place breast-side down in a large roasting tin and cover loosely with foil. Calculate the cooking time using the table below. Place the turkey in the middle of the oven for around thirty minutes then reduce the temperature to 190°C / 370°F / gas mark 5 (less for fan-assisted ovens). About thirty minutes before the end of cooking, remove the foil and turn the turkey on to its back. To avoid over-cooking, put a fork into the inside of the thigh. The turkey is cooked when the juices run clear and are not pink. Let the turkey stand for at least 15 minutes before carving. Remove both legs and wings. Slice the breast meat from one side then repeat on the other. Roasted turkey with fig, apple and shallot stuffing with fresh sage served with homemade sherry gravy. 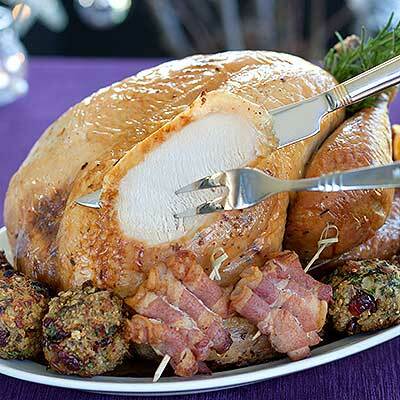 Roasted turkey with spiced cranberry, apple and sage stuffing served with homemade cranberry and madeira gravy. A spiced cranberry, apple and sage stuffing cake which can be served with turkey or other meats. A turkey, pea and mushroom pie with white wine sauce and a rosti potato topping. A turkey and creamy Stilton blue cheese filling with puff pastry. Turkey and Brussels bubble and squeak cakes served with rocket salad, poached egg and red pepper sauce. Turkey, red pepper and basil frittata, ideal with green salad. Turkey and wild mushroom risotto with Parmesan cheese. Hot and spicy turkey large or mini individual pizzas.